This is the kind of place you will not find on your usual guidebook. 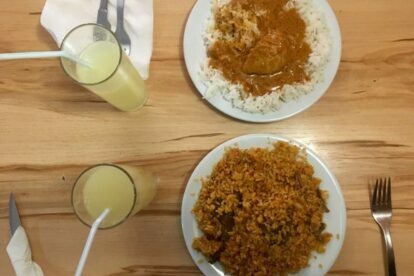 It’s a hidden place, but highly recommended if you are willing to try home-made, authentic West African dishes. This place does not stand out for its fancy decoration or menu, but for the friendly and homely approach and service from the native workers who will try and joke with you or start a conversation if you’re up for it. The menu is composed by only five dishes, four of them rice-based and one of them cous-cous based. What differentiates each dish is the sauce or condiment, e.g. one of the most iconic and popular throughout West Africa, Maffe, a stew with a peanut sauce. Super Kanja is another option, with palm oil, veal and vegetables or Thep Bu Yapp, fried rice with meat or fish. Each dish only costs 6.50€. If you are not so hungry, you can opt for 1/2 a dish, which will only cost you 4€. For drinks, if you want to try something different and authentic, you should chose the Bisap (very popular in Senegal, made of hibiscus flowers), or ginger — as the name already suggests, a refreshing ginger drink with some lemon and honey. If you’re not feeling so adventurous on drinks, they also offer very affordable cocktails (mojito, piña colada, etc) for only 4€ and beer for only 2€. If you’re around Drassanes looking for something affordable and at the same time a place that will transport you to another country, this is your place!